Treasury Department Assistant Secretary Neel Kashkari has been selected to head the Treasury's new Office of Financial Stability. The government's $700 billion bailout plan is in the hands of this man. Neel Kashkari, a relatively green assistant secretary in the Treasury department, will be responsible for the government's purchasing of billions of dollars of bad assets from banks and other financial agencies. His career has been a short one.  Kashkari grew up in Stow, Ohio, an Akron suburb. As a high school student, he was a fan of heavy metal bands like AC/DC, whose lyrics dot his high school yearbook. He is 35 years old.  He comes from a family of scientists. Father Chaman has a doctorate in engineering, and won a Presidential award for his work in getting water to African villages. Kashkari's mother, Sheila, is a retired pathologist, and his sister Meera, specializes in infectious diseases.  He and his wife Minal live in Silver Spring, Maryland, with their dog Winslow.  Neel's first job was as an aerospace engineer at TRW, where he worked on technology for NASA projects such as the Webb Space Telescope, which is due to replace the Hubble.  He decided to change careers and go to Wharton Business School at the University of Pennsylvania. 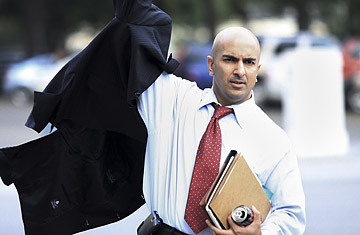 After getting his MBA, Kashkari joined Goldman Sachs in San Francisco, specializing in IT security.  He followed former Goldman Sachs CEO Henry Paulson to the Treasury Department, where he was hired as a senior adviser in 2006. In short order, he was assigned to work on the department's response to the housing crisis, during which time he grew close to Paulson.